The times when a waffle maker was just a waffle maker are long gone. As consumers, we are facing a plethora of products just to purchase one single kitchen appliance. 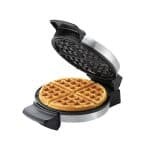 Our ultimate buying guide to find the best waffle makers and best waffle irons in 2019 is here to help you to find the best product for you and your kitchen. When you search for ‘What is the best waffle maker’ one can quickly give up because of information overload. That’s how I felt when looking to replace our antique waffle iron that served our family well for many years. There are waffle makers with removable plates, waffle irons you can flip and others that are specialized in making Belgian or Classic style waffles. 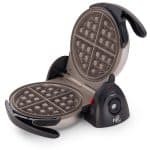 Our guide to buying the best waffle maker will not only give you all the information and in-depth details about the different styles and features of the best waffle irons available on the market but will also discuss the benefits as well as the drawback of our best waffle maker choices. If you already have a certain model or type of waffle maker in mind, please check the table of contents and click on the link that will take you straight to the product review. Waffle Irons For Making Classic (American Style) Waffles. What Is The Difference Between A Belgian And A Classic (American) Waffle? How Do I Clean A Waffle Iron? Do I Need To Season The Waffle Maker? How Do I Know When The Waffle Is Cooked? How Long Does A Waffle Maker Typically Last? What Is The Material For The Nonstick Surfaces? What To Do Before Using Your Waffle Maker For The First Time? What Is The Advantage Of A Waffle Maker You Can Flip? What Can I Do With Leftover Waffles? What Is The Best Waffle Maker To Buy? A waffle maker is a small kitchen appliance that easily finds a spot on the bench top or snugs in between other items in your kitchen cupboard. With a price range between $20 and $50 on average, it is also quite inexpensive to get. Waffles are fantastic to feed the hungry family or unexpected guests. Crispy waffles smothered in butter, with a generous layer of maple syrup and a generous serving of thick cream are always so delicious and a treat for the whole family. Making these yummy treats remind me of my childhood when my mom spoiled us with hot chocolate and warm waffles on these lazy Sundays before heading to Church. Not only can you serve up waffles with delicious sweet toppings but also as a savory dish filled with ham and cheese or whatever you can think of. To me, a waffle iron is an essential tool; everyone should have at home. Create wonderful (childhood) memories for your family and loved ones. The Hamilton Beach Flip Belgian Waffle Maker is everything we are looking for in a great waffle iron. It makes thick crispy and fluffy waffles without leaving a mess. The ‘flip’ option ensures that the batter gets spread out evenly and therefore cooks right through. The removable drip tray makes sure that your kitchen bench stays clean from spills of the batter. Cleaning is a breeze. Simply pop the easy to remove grids and the tray into the dishwasher, and the work is done. The Hamilton Beach features two indicator lights: red for power on and green indicates when you can put the batter in, ready to cook. Simply pour in one cup of batter, close the lid, lock the handle and flip it over, so the batter spreads evenly for consistent cooking. You’ll also find an adjustable browning control for a crispy outside and fluffy inside. Easy! The waffle will be ready to eat in five to eight minutes. Keen on some numbers? Here we go. The Hamilton Beach is sooo easy to clean thanks to the removable grids and non-stick surface. Usually cleaning a waffle iron can be cumbersome but these times are over with this model. We do love the brushed stainless steel finish which looks stylish in any kitchen. Another plus is the indicator lights as well as the adjustable temperature control. The handle is foldable which is ideal for easy storage. We haven’t found a product yet that is a 100%perfect, and the Hamilton Beach waffle iron is no exception. The cord is a bit on the shorter side with only 26″ long. There is also no beeper to indicate the waffle is cooked. The baking time is a bit long with around 5 to 8 minutes to cook. 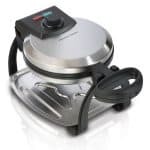 The Hamilton Beach Flip Belgian Waffle Maker With Removable Plates is a great all-rounder that produces yummy tasting waffles, is easy to clean and thanks to the ‘flip’ option cooks the waffles evenly. You can’t go wrong with this waffle iron! If you want to get a quick overview of our top choices of the best Belgian Waffle Makers with removable plates, please refer to our comparison chart. For more information about every single one, please scroll down for a short review. The Cuisinart WAF 300 not only offers removable waffle grids but also comes with pancake plates which you can use to cook pancakes, eggs, and sausage patties. But for now, we are only focusing on the waffle maker option. For easy use, the plates are marked so you know if they go in the upper or lower part of the waffle iron. Just remove the individual plates with the press of a button and pop them in the dishwasher. The Cuisinart has a wide, cool to the touch handle. It also has two indicator lights as well as an audible alert to let you know when the waffles are ready. Put half a cup of batter in the middle of the grids and spread them out. The waffle should be ready in around 5 minutes. You’ll have six temperature settings for lighter or more crispier results. The removable and dishwasher safe plates are great for cleaning. We do like the audible alert and the fact that you can store the waffle maker upright for a smaller footprint in the kitchen cupboard. The reheating time between waffles is also relatively quick. Plus, you’ll get a recipe book and tongs for free with your purchase. Here are some things consumers have found: the waffle doesn’t get as crispy as some people like them. The first heating up time can take quite a long time. A few customers noticed uneven heating and therefore the waffles not being cooked consistently. If you are looking for a Belgian waffle maker that has removable square plates, then the Cuisinart WAF 300 is an excellent choice. The Krups Belgian Waffle Maker looks stylish with its stainless steel housing and would fit into any kitchen design. The Krups produces 3/4″ to 1″ thick, crispy waffles in around 7 minutes baking time. You’ll need 1/2 cup of batter per waffle. The temperature control allows you to set five different settings and a ‘beep’ will let you know when the waffles are ready to eat. 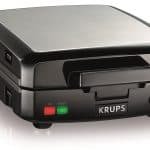 The Krups Belgian Waffle Maker is easy to store with a wrap-around cord, a locking lid, and upright storage. It looks stylish and produces nice crispy waffles. The audible alert is helpful too. With seven minutes, it takes a long time to cook the waffles. Some customers noticed unevenly cooking. The Krups is quite heavy at over 9 pounds. The Krups Belgian Waffle Maker is a reliable machine which is easy to store. By the way, you may ask what is the purpose of flipping the waffle? When you flip the waffle iron it ensures that the batter spreads out evenly and as a result, the waffles cook more consistently. 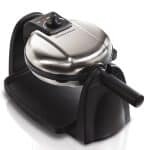 The Hamilton Beach Belgian Waffle Maker features all the things a good waffle maker should have: a nice brush stainless steel finish, a dishwasher-safe drip tray, a cool to the touch handle and deep grids to make those yummy Belgian waffles. All you need is a 1/2 cup of batter to produce a tasty round waffle in record time – around three minutes. You can also adjust the temperature and when you are done, store it away standing upright. The brush stainless steel finish, the non-stick grid surface, and the drip tray to avoid a mess on the kitchen bench. To flip the waffle, just pour the batter, close the lid and twist the handle around. Done! It also comes with a five-year limited warranty! The cord is a bit short, and some customers found the waffle maker hard to clean. There is also no audible alert. The Hamilton Beach is a solidly built, high-quality waffle maker. Great value for money plus an impressive 5-year limited warranty. 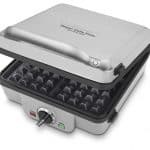 The Presto Waffle Maker is a Bestseller on Amazon with over 5000 sold items and a star rating of 4.6. It features a nonstick ceramic coated grid which is easy to clean. For more options on Teflon free waffle irons, be sure to read our guide Top Waffle Makers Without Teflon. With the brushed stainless steel exterior, this waffle iron looks pretty stylish. There is only one red light indicator that goes out when the element is hot enough to bake the waffle. One cup of batter is enough to make a big round 1″ thick, crispy waffle in four minutes. We like the nice big handle and the digital timer that beeps when the set time is up. The waffles are baked evenly. You can store the Presto in a vertical position. One important plus is that the nonstick coating is free of Teflon. There is no temperature adjustment, and the timer operates separately from the waffle maker. You’ll need to put batteries in for the timer. Some customers noticed that their Presto waffle maker stopped working after a year. The Presto Waffle Maker makes thick, crispy waffles in under 4 minutes. It’s a solid product that offers good value for money. The Cuisinart Double Belgian Waffle Maker is perfect to feed the crowd. You can make two round waffles at the same time. You can also just use one side if you want to. For each side, there is a green indicator light and six temperature settings. You will hear a ‘beep’ when the waffle maker is heated up and another ‘beep’ when the waffles are cooked. Flip it quickly by twisting the handle to ensure each waffle is cooked to perfection. You’ll need 1/2 cup of batter to make one waffle. The stainless steel housing looks great and makes for durability. The audible alert comes in handy as well as the temperature control. So you can get on with other things and don’t have to worry about overcooked waffles. Thumps up! The Cuisinart waffle maker is heavy due to the double-sided waffle elements. That means it also takes more counter space and storage area in the cupboard. The Cuisinart Waffle Maker WAF – F20 is ideal for feeding a large family with lots and lots of delicious Belgian waffles. A high -quality, robust product! The Gourmia Flip Pro Waffle Maker is another great example of a waffle maker with a flip option. It makes fluffy thick Belgian style waffles that soak up all the delicious malt syrup with melting butter on top. To get you started, you’ll also receive a free waffle recipe book. The LCD display features a power-on switch plus an adjustable timer. The display is easy to read and even while the waffle is cooking, you can reset the time by pushing the button. Underneath the waffle maker is a removable drip tray to avoid nasty spills on your countertop. The round waffles are 7″ big and cooked in around two to three minutes. The stainless steel housing looks stylish and is of high-quality. The nonstick ceramic coating makes sure that no waffle will stick to the waffle plates. The Gourmia Flip Waffle Maker is easy to clean and thanks to the adjustable timer make cooking waffles a breeze. The Gourmia Flip Pro Waffle Maker has received great reviews on Amazon but some customers experienced also some issues with this waffle iron. There have been issues with the handle that can be flimsy and some customers complained about the timer which can be hard to reset or sometimes the buttons didn’t work as expected. The Gourmia waffle maker is a solidly build waffle iron with a flip option that makes delicious thick Belgian style waffles. The LCD display is easy to read and allows you to adjust the cooking time. It is easy to use and to clean and comes with a 1-year warranty. The free recipe book is an added bonus. If you are looking for a basic Belgian Waffle Maker without the bells and whistles, then this is the place for you. These are the most affordable ones for under $30. The Oster Belgian Waffle Maker is a Bestseller on Amazon and has all the features a solid waffle maker should have: non-stick cooking grids, red and green light indicators, cool-touch handles and it even stores vertically. You will need a 3/4 cup of batter to get a crispy round 1″ thick Belgian waffle. The Oster Waffle Maker has an adjustable temperature control which is always a useful feature. The stainless steel housing looks nice, and the waffle maker itself is not too big. We also like the temperature control which comes in handy. It doesn’t make thick Belgian waffles; these are a bit thinner. Some customers found that the appliance didn’t last very long. The Oster is a solid waffle maker for a small price tag. The Black and Decker Waffle Maker has a chrome housing and can be stored upright with the cord wrapped around for more convenience. It makes round 7″ waffles in 2 to 3 minutes. You only have a ready indicator light, so you know when the waffle iron is hot enough to put the batter in. We do like the two-year warranty time for peace of mind. The baking time is reasonably short compared to other waffle makers. There is no adjustable temperature control, and the housing gets very hot. The Black and Decker is a basic waffle maker with an excellent two-year warranty. The Classic Waffle Maker was our only option thirty years ago and is hard to find nowadays. We researched on Amazon and found only a few options of waffle makers that make Classic style waffles. The reviews for them were quite mixed, from raving to absolute disastrous. So it seems that it is quite tricky to find a reliable, robust, good quality waffle maker that makes classic waffles. But finally, we have found two waffle makers who are of high-quality and recommend to everyone who loves American style waffles. The Breville No Mess waffle maker is one of our favorite waffle irons. It is great that the nonstick coating is Teflon free and the overflow channel means that cleaning is a breeze. 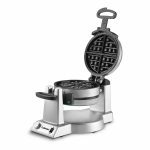 The Breville waffle iron comes with all the features we are looking for in a high-quality waffle maker. It has two indicator lights, an audible alert to signal when the waffles are cooked and a knob for browning control. It takes around four minutes for the waffles to cook but it is worth the wait. The thickness of the waffle is somewhere between a Belgian waffle (not as thick) and the Classic style waffle (not too thin). My kids love them. For easy storage, you can wrap the cord and lock the lid for upright storage. For our more detailed review for the Breville No Mess waffle maker, please click here. Overall, this is a stylish and durable waffle maker that comes with a 1-year warranty. Highly recommended. The Cuisinart WMR-CA is a bestseller on Amazon with over 3000 sold items. There is a need for the ‘standard’ thin crispy American style waffle, and Cuisinart serves this niche well with their product. The Cuisinart has two indicator lights for heating up and also goes on when the waffle is finished and ready to eat. You can also control and adjust the temperature with five different settings. The waffles bake very fast with two minutes (on setting three). The best way is to pour 1/2 cup of batter in the center of the baking plates and close the lid. The batter will spread out by itself. Here are some special numbers: the size of the waffle iron is 11″ x 8.5″ x 4″ and it weighs 3.9lbs. The waffles are 7″ round and 1/2″ thick. It is always great to have different temperature settings. Best of all, this waffle iron comes with a three-year warranty. The handle seems to be a weak point since a few customers experienced it to come off. A few customers found this waffle maker to be flimsy and not the quality Cuisinart is known for. Even though the reviews are quite mixed, we feel that the Cuisinart Classic Waffle Maker is a reliable product to make American waffles. It comes with a fantastic 3-year warranty. Be sure to read our post Our Choice Of Waffle Irons That Make Thin Waffles for more options. A Belgian Waffle usually has a thicker consistency and when cooked properly is fluffy inside and crispy on the outside. The deep pockets are perfect for soaking up the delicious goodness of melted butter, maple syrup, whipped cream and a generous dusting of powdered sugar. The batter was initially prepared with yeast, but today we use baking powder instead. The best Belgian Waffles are at least 1″ or, even better, 1 1/2″ thick. We added the waffle thickness in the comparison charts. A Classic (American) Waffle is denser and much thinner than Belgian Waffles. They are traditionally served for breakfast. Both styles can be served as a sweet or savory dish and come in a round, square or rectangular shape. Either way, it’s delicious. First up, unplug the waffle iron and wait until the appliance has cooled down before you attempt cleaning it. All of our reviewed waffle irons have a nonstick cooking grid, so they are relatively easy to clean. Just wipe them down with a damp cloth. If some batter gets stuck in hard to reach areas, try to get in there with a toothpick. Waffle irons with removable plates are the easiest once to clean. Just pop the plates into the dishwasher, and the work is done. Read more in our post How To Clean A Waffle Iron. It depends on the particular waffle maker. Even though the grids are nonstick, the waffles can still stick to the baking plates. In most cases, it is best to season the grids slightly with some cooking oil before you put the waffle batter in. My tip: Instead of greasing the plates, add melted butter or oil to the batter to prevent the waffle from sticking. It is also good to check the user manual for further instructions. Most waffle makers have an indicator light or an audible alert that will let you know when the waffle is cooked. If you don’t have an indicator light, then a good sign is that no more steam is coming out of the waffle maker. Open the lid carefully and check if the waffle is done to your liking. Be sure to read How To Make Waffles In A Waffle Maker for more information. A high-quality waffle maker should last a few years ideally. But when we checked out the reviews on Amazon, the quality, and longevity seems to be an issue for quite a few models. Most manufacturers use Teflon as a nonstick material. Are you looking for a waffle maker without Teflon coating? Be sure to read our post here. We always recommend reading the instruction manual before using your new appliance. It is also a good idea, to heat it up without baking any waffles to get rid of the smell some waffle irons have. Once the waffle iron is cool to the touch, unplug the appliance and wipe it with a damp soapy cloth and again with just water. The ‘flip’ option helps to spread the batter evenly into the baking grid. Your waffles cook evenly and consistently. If you have any leftover waffles, you can store them in an airtight container and keep them in the fridge or pop them into the freezer. To reheat, simply put them in your toaster. The answer to this question depends on what features are important to you as well as your budget. The cheapest ones are the basic Belgian waffle makers. We prefer a waffle maker that has removable plates and can be flipped. For large families, the double-sided waffle maker might be the best option since you can cook two waffles at the same time. Or, you could get one that bakes waffles quickly at around three minutes. Another question to ask yourself is if you’d prefer Belgian or American waffles. We do hope our buying guide has been helpful in answering most of your questions and also to find a waffle maker that will be a great asset to your household. 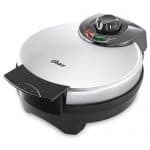 We have tried to cover all the different options of waffle makers that are available to customers – from waffle makers with removable plates, waffle makers you can flip to basic waffle irons for Classic style waffles. If you liked this post, please share it with your friends on social media.